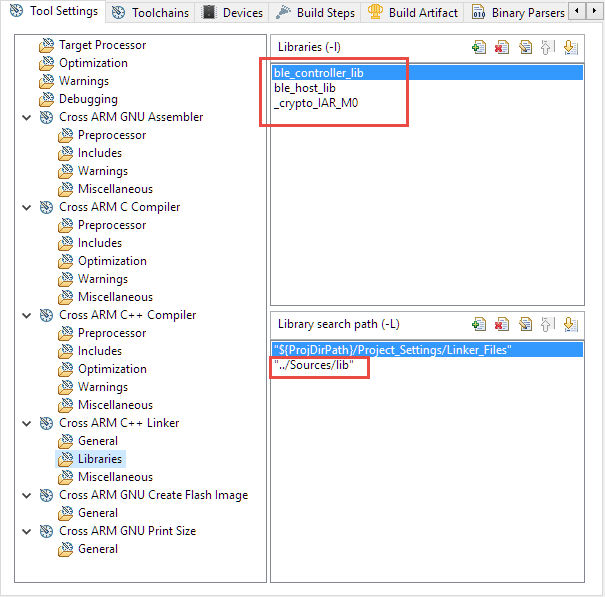 The BLE stack, sources and examples provided by NXP need the IAR Embedded Workbench to compile and build it. That stack is running on the NXP Kinetis KW40 SoC which is responsible for the touch sensing and the BLE communication on the Hexiwear (see “Hexiwear: Teardown of the Hackable ‘Do-Anything’ Device“). On the other side, it is strange that NXP does not provide the BLE stack in the first place using their own tools: The NXP Kinetis Design Studio is based on open source, Eclipse and includes free-of-charge and unlimited GNU (gcc, gdb) tools. Why not using this instead? 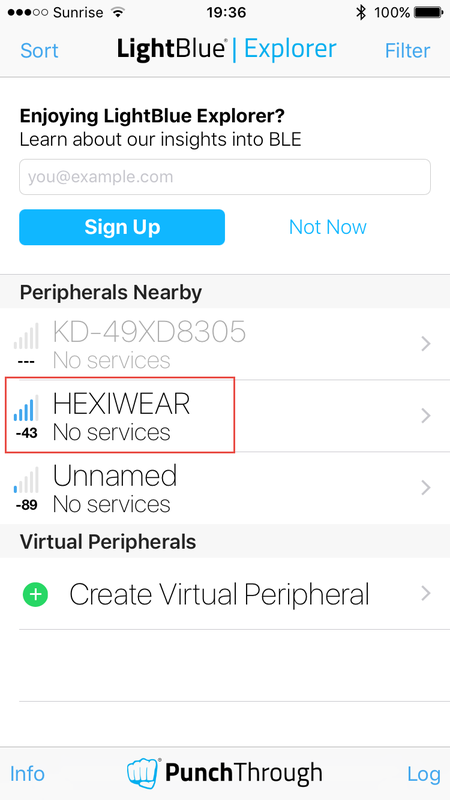 💡 The Hexiwear is using the NXP KW40 device. For the newer NXP KW41 there is an updated Connectivity Software V1.0.2 which now includes projects for Eclipse based Kinetis Design Studio. In the next sections, I describe the most important porting steps. The current project and sources are available on GitHub. The ‘app_preinclude.h’ is a header file which has global settings and is included for each compilation unit. 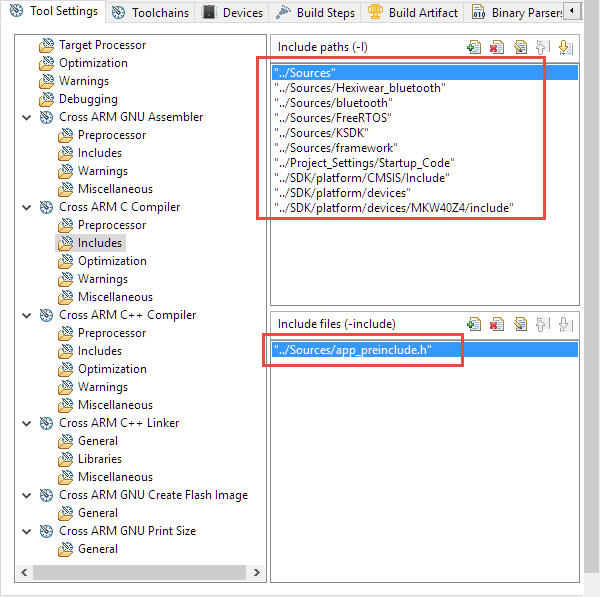 The IAR project used a canned (library) version of the SDK: for a better portability and be able to debug the SDK sources I have added the SDK sources (and not the library for it) to the project. Things are not optimized yet. Because the BLE stack is using the Kinetis SDK V1.3, it adds many unnecessary layers and is using the (not needed) OS adaption (OSA) layer to FreeRTOS. If I can find the time, I will update the used V8.2.0 FreeRTOS in the stack to the more recent V9.0.0 FreeRTOS. Other vendors make it easier and provide their stacks for GNU and Eclipse out of the box. I hope that eventually NXP will provide source code for more if not all parts of the BLE stack, because using archive libraries like this is not very development-friendly and can lead to all kind of compatibility issues. For now, things seem to be working which is a good first step :-). 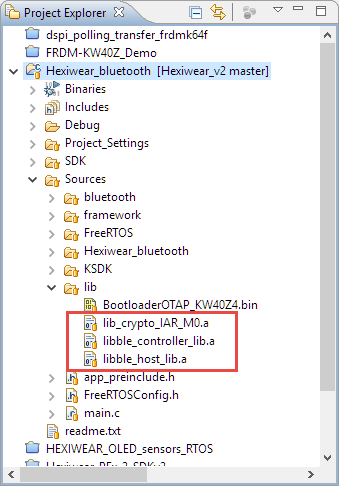 This entry was posted in ARM, Bluetooth Low Energy, Boards, Building, Cortex, CPU's, Eclipse, Embedded, FRDM-KW40Z, Freescale, gcc, KDS, Kinetis, NXP, SDK, Thoughts, Tips & Tricks, Tutorial and tagged arm gcc, BLE, Building, Eclipse, freedom board, FreeRTOS, GNU, KDS, NXP, Porting, stack, technology, Tips&Tricks, tool chains by Erich Styger. Bookmark the permalink. Remember I told you I bought 2 KITs from NXP? you are God-sent my friend. And… that wasn’t long… NICE!!! The holidays aren’t even over yet and there is light at the end of the tunnel. I guess people have a lot of time on their hands :-). Thanks for posting. I got the FRDM-KW1Z and FRDM-KW24D512 KITs, will be working on this with some students next few weeks as the semester has started. Hoping to report good progress. Great Work! 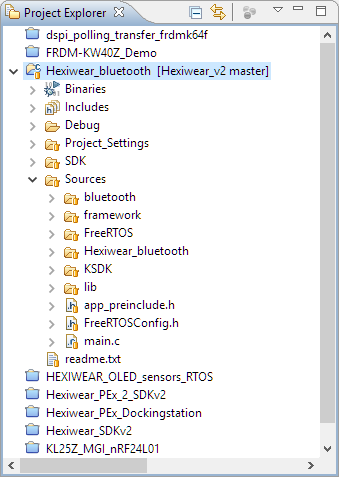 I`ve been trying to modify the KW4Z firmware on the Hexiwear and implement a 802.15.4 stack, but as the project was too big I wasnt able to do it with the free IAR version. In the following weeks I will try your aproach and see if it works. Could you explain the steps in a little more depht? Everything is perfect, dont worry. Ive managed to build the code in KDS and now im going to try to upload it to Hexiwear. I think the problem is with pyOCD. I was never able to use the pyOCD debug connection. I’m using P&E Multilink and Segger J-Link to debug the Hexiwear on the docking station. It seems pyOCD doesnt have the KW40Z on its supported targets, thats why it wasnt working. Im trying to see if there is any way of modyfing the KW40Z firmware without having to purchase any additional hardware. Do you know if theres any way? If not could you give me guidelines on how to use the P&E Multilink and Segger J-Link to debug with the docking station please? Ive never used this kind of tools and Im a bit lost. you could use a FRDM board with CMSIS-DAP to debug the board. But the problem won’t go away because the CMSIS-DAP (or even DAPLink) firmware is not to the level of commercial debug firmware like in a P&E Multilink or Segger J-Link. I recommend that you invest money into a commercial probe. I’m not sure about P&E, but Segger has an EDU version of their probe (around $50-60) which can be used for non-commercial/hobby/educational projects. If working in a company or doing commercial products, then not be able to afford $100 for a probe sounds not reasonable to me. With KDS you can use P&E/Segger probes out of the box for normal debugging. On the Hexiwear docking station you have to adjust the DIP switches, see https://mcuoneclipse.com/2016/12/07/flashing-and-restoring-the-hexiwear-firmware/. Hi Erich, thanks again for your help. 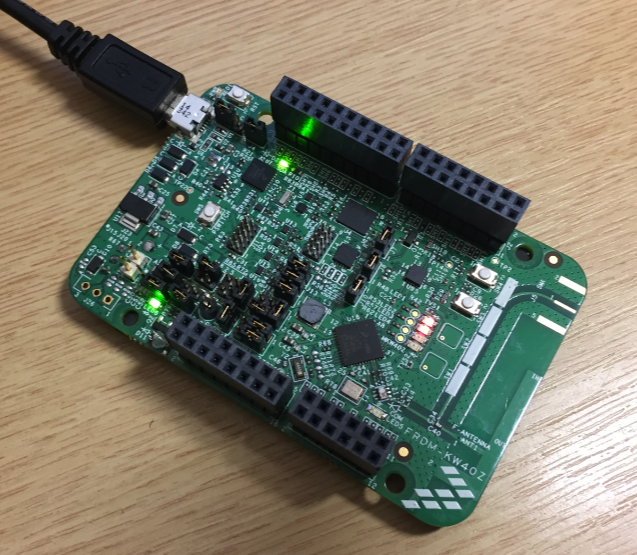 You mean using a FRDM Board with the KW40Z to program the Hexiwear like you explain here? Im not so interested in bebugging as in flashing the code to Hexiwear´s KW40Z. Been trying to look for a way to flash it using the serial port and havent found one yet. If neither of these work Ill look into getting some commercial probes, but we wanted to avoid this and give users a less expensive way to program the device. no, that approach is using the MSD bootloader on the FRDM board to program the other board. For this you have to have a KW40 firmware present on the FRDM board which I think does not exist. Thank you so much for your help man, you’re great. Your right, OpenOCD as pyOCD doesn’t support the KW40Z, a shame. My work is entirely educational, I wanted to do a project with Hexiwear for my universities Final Degree Assignment and use the 802.15.4 capabilities it has for gathering information from various sensors we have. For this I have to be able to change the KW40Z firmware. I tought It would be as easy as it was for the MK64, but Its been giving me a headache for the past two weeks. They just said on the Hexiwear forums that they’re going to upload some instructions on how to set up the KW40Z project with IAR so maybe I will be able to do it that way. If not I think I will grab a Segger EDU like you suggested. They have added some information which hopefully get you up and running on IAR. Perfect, ill check them out as soon as posible. will this code work with the KW30 also? I have no experience with the KW30, so I cannot give any advise on this one.